The Special Tank no. 320 is posed with Thomas Robertshaw Driver and his son Thomas W. Robertshaw Fireman who lived in Wavertree Liverpool according to the enquirer to whom they are related. The Wavertree location would indicate an Edge Hill based loco. 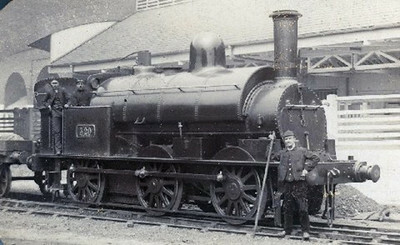 The date must be between Feb 1880 and Feb 1897 when the loco was renumbered. Can anyone identify the location or improve on the date please. Behind the locomotive there seems to be a large cattle dock which is partially beneath a bridge arch to the left which must help with identification. I am tolerably certain that we are looking at the cattle pens on the north side of Canada Dock station, Bootle branch. The arch behind the engine is the northernmost of Bankhall Lane bridge (or viaduct more like). The two side arches are right for this location - click here which includes a good aerial view with these on the right-hand edge. I don't have anything to narrow down the date yet.